Who can resist a new year's resolution? If yours is learning to cook, or be a better cook, then it is a worthy resolution indeed! One of the questions I have been asked most over the years by novice cooks is a simple, but very important one: "How do I learn to cook?". Busy schedules and tight budgets mean that cooking classes aren't always on the cards. So here is my advice to those who want to really take a leap forward with their cooking at home in their own kitchen. And remember, this can be applied to more advanced cooks, just pick recipes or techniques that are relevant to your level of expertise. You know, we never stop learning! 1. Sit down and make a list of the 10 things you most like to eat (for a well-rounded cook I would suggest not all desserts, unless your aim is to become a master pastry chef!) Take inspiration from your favorite cookbooks or blogs but don't be too ambitious, just choose the things that you really want to perfect. 2. Then, like a pianist learning to play a new piece of music, you simply practise. Just cook, cook, cook! Practise the first recipe on your list until you feel you have mastered it, making notes along the way about what worked and what didn't - a kitchen diary can be one of the most useful tools in a cook's kitchen. 3. Move on to the next recipe on your list. By the time you have completed the list, you will have a repetoire of 10 things you can be proud of. Then of course, you'll make another list of 10 new recipes. The wonderful thing about cooking is that no matter how much you know, there is always more to learn. I think if I was to learn to cook this way today, top of my list would be roast chicken, a simple pizza, a wholesome salad with a zesty lemon dressing and a chocolate tart. What would be on your list? While everyone else is making spiced nuts for holiday party snacks and edible gifts, why not try these totally irresistible walnut bites – a darker version of the Italian panforte, with a pungent, forward flavor, and laced with freshly ground black pepper, cinnamon, cocoa powder, candied lemon peel, raisins, and walnut halves. Serve them up with a cheese course (a nicely aged Parmiggiano-Reggiano and a sip of vin santo works for me), or team them with a slice of the cheese, stack the two on a toothpick, and eccoci - the perfect holiday appetizer. 1. In a small bowl, soak the currants or raisins in 1/4 cup (60 ml) of the wine for 1 hour. 3. Center a rack in the oven. Preheat the oven to 350°F (180°C). 4. In a small saucepan, melt the butter over low heat. Add the sugar, honey, and salt, stirring to blend. 6. Place the pan in the oven and bake until bubbly, dark, and fragrant, about 35 minutes. The mixture will be sticky, but will firm up as it cools in the pan. NOTE: Weighing and preparing your ingredients in advance (known as mis-en-place) will make putting the recipe together faster and considerably less messy. And as a bonus, you're much less likely to forget an ingredient. A good tip to use for every recipe. WINE SUGGESTION: As an appetizer, I love these with a glass of Champagne. With the cheese course, try an Italian vin santo, a Sicilian Marsala, a Porto, or a French vin doux naturel, such as the Grenache-based Rasteau from the southern Rhône. I always encourage my students to “buy by the back label,” that is, to look at the back label on any wine bottle to see who the importer is. For novice wine tasters in particular, I advise students to take a list of well-informed importers into a wine store and ask the merchant “Do you have any wines from any of these importers?” Once you begin connecting importers’ names to wines you love, it's like shopping with a personal sommelier. Many of them have excellent and informative web sites, worth a tour on their own. Here’s a list of my preferred companies importing wines from France to the United States. Eric Solomon – Specializing in wines from Spain and France, including Clos Chanteduc Côtes-du-Rhône; and Domaine de la Janasse and Domaine de Marcoux in Châteauneuf-du-Pape. Kermit Lynch Wine Merchant – Specializing in wines from Italy and France, including Auguste Clape in Cornas; Domaine Coche-Dury and Antoine Jobard in Burgundy; and Mas Champart in the Languedoc. North Berkeley Wine – Specializing in wines from Chile, Italy, and France, including Le Cos du Caillou and Clos du Mont Olivet in Châteauneuf-du-Pape; Martinelle in Beaumes de Venise; and Domaine la Bouïssière in Gigondas. Christopher Cannan – Specializing in wines from Spain, Portugal, Italy, Hungary, and France, including Château des Tour in Vacqueyras; Vieille Julienne and Château Rayas in Châteauneuf-du-Pape; and Domaine Anne Gros in Vosne Romanée. Louis/Dressner Selections – Specializing in wines from throughout Europe, including Oratoire Saint Martin and Domaine Marcel Richaud in Cairanne; Château d’Oupia in Minervois; and Jean Thévenet/Domaine de la Bongran in Burgundy. Robert Kacher – Specializing in wines from Portugal, Argentina, and France, including Domaine Santa Duc in Gigondas; Domaine Michel and Stéphane Ogier and Domaine Jamet in Côte-Rôtie. Kysela Père et Fils – Specializing in wines from Australia, New Zealand, the United States, Argentina, and Europe, including Domaine Grand Veneur and Domaine de la Mordorée in the southern Rhône. Martine’s Wines – Specializing in wines from France, including Château Rayas in Châteauneuf-du-Pape, Château de Fonsalette in the Côtes-du-Rhône; Château des Tours in Vacqueyras; and Domaine Georges Vernay in the Northern Rhône. Michael Skurnik – Specializing in wines from France, particularly those selected by Daniel Johnnes, who is also wine director for Daniel Boulud in New York City, with wines including Saint Préfert in Châteauneuf-du-Pape; Grange des Pères in the Languedoc; and Les Héritiers du Comte Lafon in Burgundy. Vineyard Brands – Specializing in wines from Chile, New Zealand, South Africa, Spain, Italy, and France, including a collection of wines from Château de Beaucastel in Châteauneuf-du-Pape and the southern Rhône; Dauvissat in Chablis; and Salon in Champagne. Peter Weygandt – Specializing in wines from Austria, Australia, Germany, Italy, and France, including Domaine Gérard Charvin and Raymond Usseglio in Châteauneuf-du-Pape; and Daniel and Denis Alary in Cairanne. These wonderful chocolatey desserts are perfect for Christmas cocktail parties: they couldn't be easier to make, and are best served in small shot glasses so you can really savor the intense hit of chocolate. Even for a seated dinner party this is the perfect serving size, paired alongside a chocolate sorbet. Equipment: A double boiler; a baster; eight 1/4-cup (65 ml) vodka or shot glasses. 1. Break the chocolate into small pieces. 2. In the top of the double boiler set over, but not touching, boiling water, heat the cream and 1/4 cup (60 ml) of water just until warm. Add the chocolate pieces, stirring until the chocolate is melted. Add the butter and stir to melt and combine. Spoon the mixture into the glasses. (I have found that if you use a baster to “pipe” the chocolate into the glasses, it is less messy.) Refrigerate until firm, about 20 minutes. 3. At serving time sprinkle, with fleur de sel and chocolate nibs. MAKE-AHEAD NOTE: The custards can be prepared up to 3 days in advance, covered and refrigerated. NOTE: What are nibs? Cacao nibs are pieces of cacao beans that have been roasted and hulled. Nibs taste faintly similar to roasted coffee beans. They have a great crunch, a slightly nutty flavor, and a pleasant touch of bitterness. WINE SUGGESTION: I love to serve this treat with the chocolate-friendly, sweet Banyuls reserve wine from Domaine La Tour Vieille in the Languedoc. With its touch of spice, hint of chocolate and overtones of raspberry, what could be a finer partner for a chocolate dessert? It’s no secret that I love making pizza, and Flammekuechen, the Alsatian version of a thin-crust pizza made with cream, onions and bacon, is a favorite, to bake in my wood-fired oven now that winter is really here. In this version I have lightened the recipe by replacing the traditional cream with non-fat yogurt or fromage blanc and steaming the onions instead of sweating them in fat. However, on a chilly night you might just feel like adding back the cream and sweated onions! Serve with a green salad and a class of chilled Riesling and transport yourself to Alsace! Equipment: A baking stone; a steamer; a wooden pizza peel; a metal pizza peel or large metal spatula (If you don’t have a baking stone and a wooden peel, simply sprinkle the polenta on a baking sheet, place the round of dough on top, assemble the tart, and bake on the baking sheet). Place the baking stone on the bottom rack of the oven. Preheat the oven to 500°F (260°C). Separate the onions into rings. You should have about 4 cups (1 liter) loosely packed onions. Bring 1 quart (1 liter) of water to a simmer in the bottom of a steamer. Place the onions on the steaming rack. Place the rack over simmering water, cover, and steam until the onions are al dente 5 to 6 minutes. Remove the basket from the steamer to drain the onions. (This can be done 2 to 3 hours before serving. In a large dry skillet, brown the pancetta over moderate heat until crisp and golden, 3 to 4 minutes. With a slotted spoon, transfer the pancetta to several layers of paper towels to absorb the fat. Blot the top of the pancetta with several layers of paper towel to absorb any additional fat. In a medium bowl combine the yogurt, nutmeg, onions, and half of the pancetta. Stir to blend. On a generously floured work surface, roll the dough into a 12- inch (30 cm) round. Sprinkle the wooden pizza peel with polenta and place the round of dough on the peel. Working quickly to keep the dough from sticking, assemble the tart: Spread the yogurt mixture evenly over the dough. Sprinkle with the remaining pancetta. Slide the dough off the peel and onto the baking stone. Bake until the dough is crisp and golden, and the top is bubbly, about 10 minutes. With the metal pizza peel or large spatula, remove the tart from the baking stone. Sprinkle generously with pepper. Transfer to a cutting board and cut into 8 wedges. Serve immediately. Wine suggestion: A young, fresh dry Alsatian Riesling is in order here: Try one from the reputable firms of Ostertag or Zind-Humbrecht – crisp, dry, smoky wines with a saline touch of chalky minerality, an even match for the creamy onion and pancetta mixture offset with a hit of black pepper. In the bowl of a food processor combine the whole wheat flour, bread flour, yeast, salt, and sugar and pulse to mix. Combine 1/2 cup (125 ml) of hot water and the olive oil in a measuring cup. With the motor running, gradually add enough of the hot liquid for the mixture to form a sticky ball. The dough should be soft. If it is too dry, add 1 to 2 tablespoons of water. If it is too sticky, add 1 to 2 tablespoons of flour. Process until the dough forms a ball. Transfer to a clean, floured surface and knead by hand for 1 minute. Cover with a cloth and let rest for at least 10 minutes before rolling. (The dough will keep, covered and refrigerated, for up to 4 days. Punch down the dough as necessary). These recipes were originally published in Salad as a Meal. If you love this recipe, you can buy the book here! This recipe is the copyright of Patricia Wells. All rights reserved. Taste of the week: Decant or not decant? With the festive season pretty much upon us, it seems an especially good time to talk about the benefits of decanting red wine, as I am sure many a bottle will be shared in the coming weeks. In class during our wine-tasting sessions, we often do a blind taste test to understand the benefits of decanting - and the results are always surprising to my students. We test the same wine, one which has been decanted several hours before, and one that has been just opened. The decanted wine wins every time for flavor and satisfaction, no matter what the price or wine (with the exception of very old wines that might be fragile). This is because the aeration and oxygenation actually ages the wine and opens it up, So don't just get out your decanter for your special occasion reds, have it on hand to get the most out of any bottle that you are drinking. A handy tip for getting rid of stubborn wine stains on your carafe: after washing the carafe fill it with water for a few days or even until the next time you use it. And residual stains should just disappear. Discovering the cheeses of France is to discover it's diversity and it's beauty, from the green flats of Normandy, the steep mountains of the Alps, to the plains of champagne east of Paris. Each of the 150-200 serious varieties of cheese produced in France tells a tale of the regional landscape from which it comes, the types of soil, vegetation, climate, and the cows, goats and sheep that graze there. 150-200 cheeses is an overwhelming number (after all it was Charles de Gaulle who famously said 'How can anyone govern a nation that has 246 varieties of cheese?' – albeit an exaggerated estimation), so working your way through the list of 45 A.O.C* cheeses might be a more manageable task if you wish to learn about French cheese. Ask your cheese monger for a seasonal cheese, so that you can try a cheese at it's best. If you are choosing cheese for a dégustation platter or a dinner party, choose three of four different varieties that might include a semi-soft cow's cheese such as a Camembert de Nomandie, a goat's milk cheese such as a Crottin de Chavignol or Rocamadour, a blue cheese like Roquefort, and a hard aged cheese like Comté. Start with the milder cheeses, and move on to the stronger flavors. Most cheeses should be bought when at their best so try and buy your cheese the day you plan to consume it, or let your cheese monger know when you are planning on serving it so they can chose the perfect ripeness for you. Most non-industrial cheeses are best consumed within 48 hours of buying them. Do not keep cheese in a sealed box or plastic wrapping. It is best conserved individually wrapped in the original paper they came in from your cheese shop. This will help preserve their flavor. Keep the cheeses in the lowest part of the refrigerator, usually this is the crisper drawer, which is the coldest and most humid part of the refrigerator, and avoid temperatures that are too cold or too hot. Soft rind cheeses (brie and camembert) and washed rind cheeses (munster, livarot), when at their best, will live happily out of the refrigerator on your kitchen bench, but need to be kept in their original paper and wrapped in a humid cloth. For cheeses conserved in the refrigerator, they should be removed at least one hour before serving to give them time to come up to room temperature. Cold cheeses lose a large part of their flavor. * When the A.O.C (Appellation d’origine contrôlée) was officially created by the French Government in 1935, it was to specify a badge of authenticity and quality of an agricultural product. The A.O.C certifies excellence for wines, cheeses, butters, honey, poultry, and other products. The relatively newer label of A.O.P (Appellation d’origine protégée) is a European Union designation, equivalent to the French A.O.C. but includes agricultural products from all over Europe. They must however still abide by a given sets of rules of production (including geographical limits) and preparation, using established industry know-how. French producers whose products meet these guidelines can chose whether to promote their product under the A.O.C. or A.O.P. label. In modern times, as the number of A.O.C products grows, it is clear that its importance is also a marketing tool to promote the brand. However, never awarded lightly, all A.O.C and French A.O.P-certified products retain a specific quality: Each bears a special label; each plays a role in French agricultural history based on its authenticity, regional lineage, and method of production. All are required to adhere to strict standards established by the French government, and production is rigorously controlled. The A.O.C/A.O.P label remains a serious badge for consumers. If you have the chance to cook with a prized French black truffle, this recipe is one of the simplest and best-value ways to enjoy its sublime earthy flavor. The truffle butter and truffle salt (that keeps wonderfully in the freezer to be used throughout the year) really boosts the truffle flavor. Equipment: A 10-quart (10 l) pasta pot fitted with a colander; 4 warmed shallow soup bowls. 1. Fill the pasta pot with 8 quarts (8 l) of water and bring it to a rolling boil over high heat. Add the coarse salt and the pasta. Cook until tender but firm to the bite. Drain thoroughly. 2. Transfer the pasta to a large bowl, add the butter and cheese and toss to coat the pasta evenly and thoroughly. Season lightly with the truffle salt. Transfer to the warmed bowls, shower with minced truffle, if using, serve. Garnish with the additional cheese. Wine suggestions: This calls for an everyday red and of course our favorite is our own Clos Chanteduc, a simple Côtes-du-Rhône, but one that forces you to make you sit up and take notice, focusing on its note of black coarsely ground black pepper, the fine balance of fruit and acidity, as well as its easy-quaffing qualities. The blend of Grenache, Syrah, and Mourvèdre comes from vines planted mostly in the 1950’s so the flavors are rich and dense. Equipment: A small jar with a lid. 1. Place the butter on a large plate. Sprinkle with the truffle peelings and mash with a fork to blend. Transfer to the jar. Tighten the lid. 2. Refrigerate for up to 3 days or freeze up to 6 months. Serve at room temperature, or melted, as necessary. 1. In the small jar, combine the minced truffles and salt. Tighten the lid and shake to blend. Refrigerate for up to 1 week or freeze for up to 1 year. 2. For each use, remove the truffle salt from the freezer or refrigerator, remove the desired amount, and return the jar to the freezer or refrigerator. 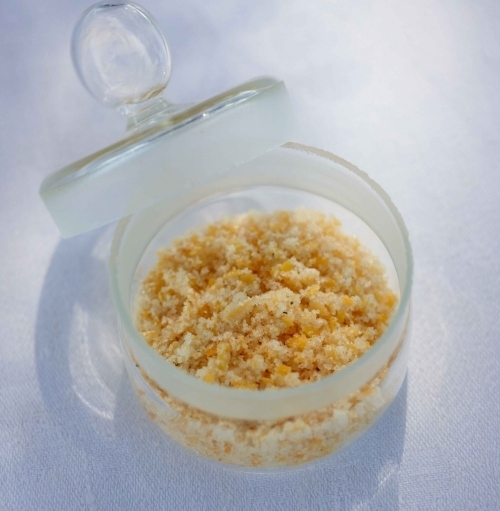 If you don't have a spice grinder, you can use a well-cleaned coffee grinder, or zest the lemon finely with a very sharp fine zester such as a microplane zester, and stir to combine. This recipe was first published in Salad as a Meal. All rights reserved. Do not reproduce without permission. A neighbor in Provence grows wonderfully rich-tasting chickpeas, which I turn into tangy, lemon-flecked dips, accompaniments to poultry dishes, or to falafel. For the most delicious hummus, cook your own dried chickpeas; the canned ones often taste tinny and are not nearly as densely flavored. Equipment: A food processor or a blender. Walter often cooks his famed Salt and Pepper Steak on Sunday nights, and we always hope for enough leftovers to prepare this salad as a meal the following day. Equipment: A small jar with a lid; a 5-quart (5 l) pasta post fitted with a colander. 1. In the jar, combine all the dressing ingredients. Cover and shake to blend. Taste for seasoning. 2. Fill the pasta pot with 3 quarts (3 l) of water and bring to a rolling boil over a high heat. Prepare a bowl of ice water for an ice bath. 4. Place the beef in a large bowl. Add just enough dressing to lightly coat the meat. Toss to blend. Add the beans and scallions and add just enough dressing to lightly coat the ingredients. Tear the arugula into bite-size pieces. Add the arugula, tomatoes, and avocado to the bowl and add just enough dressing to lightly coat the ingredients. Taste for seasoning. Serve. 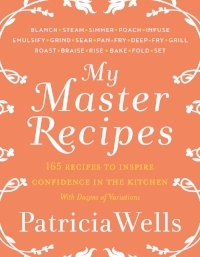 * I favor Edmond Fallot’s Tarragon Dijon Mustard, which can be found in Patricia’s Pantry on my Amazon Store. Equipment: A griddle, seasoned cast iron skillet, or heavy-duty skillet. 1. Remove the meat from the refrigerator at least 30 minutes before cooking. 2. When you are ready to cook the beef, preheat the griddle or skillet over high heat for 2 minutes. Scatter the coarse sea salt on the griddle and heat until the salt “dances,” or begins to pop, about 2 minutes. Then add the meat, unseasoned, and cook for 4 minutes on one side. Turn the meat, season the seared side with pepper and cook for 4 minutes more for rare meat, or cook to desired doneness. 3. Transfer the meat to a cutting board. Season the second side with pepper and season both sides with fleur de sel. Tent the meat loosely with foil to prevent the surface from cooling off too quickly. Let it rest for 5 to 10 minutes. 4. To serve, carve into thick slices. Serve with lemon wedges. The secret: Three rules here: sear, season, rest. Searing caramelizes the sugar and browns the proteins on the surface of the meat, resulting in more intense flavors and an attractive crust. The salt does help begin to season the meat, but because the pan is extremely hot, the meat begins to sear immediately, forming a crust that prevents the salt from drawing moisture from the steak. The final seasoning makes for meat that tastes seasoned not salted. Resting allows the juices to retreat back into the meat, resulting in beef that is moist and tender, not dry. These recipes were first published in The French Kitchen Cookbook. All rights reserved. Do not reproduce without permission.